In Luke 10:42, Jesus told Mary her decision to sit at His feet and listen to Him was the most important thing she could be doing. The same is true for us today. This year, our church is focusing on helping people spend regular, meaningful time engaging the Bible. The resources on this page will help you do just that. 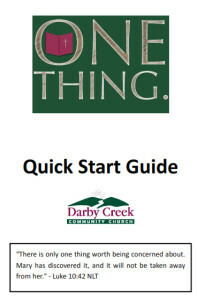 The One Thing Quick Start Guide is available at Sunday service. However, if you want to download a single-sided version of the booklet, feel free to click on the picture of the booklet here. It has the same content and it is important you read this guide first. We are asking people to consider making a formal commitment to spending at least 4 days each week meaningfully engaging the Scriptures. Click on the picture of the commitment card and you can download a PDF of the card to print out and turn in. The cards are also available at our Sunday service. In this video, Tom Short explains the S.O.A.P. journaling method that is demonstrated in the One Thing Quick Start Guide.